How could a MUX clamp save time and money? #1 During riser deployment, attaching MUX clamps and assuring they are closed properly to hold the Hotline and MUX cable is potentially a hit and miss process. Often the MUX clamps are retrieved from a box, crate or rack and installed on the Riser as it is being deployed. 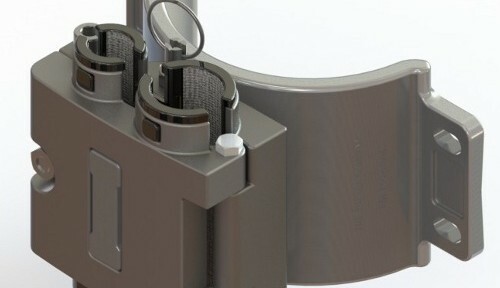 The Retractable MUX from The Subsea Company is attached to the Riser with spring plunger pins to allow the clamp to be repositioned on the mount nose to be the retracted or extended position. (See video for clarification). #2 When Mux clamps are left on Risers during storage and handling the clamps often swing open and get damaged. 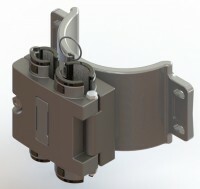 The Subsea retractable MUX clamp door cannot swing open when the clamp is in the retracted position. All of The Subsea Company clamping solutions use our exclusive “Grit” design to assure maximum load holding of cables and hoses. Our standard is to design and proof test all clamping solutions to 1000 lbs working load with maximums of 2,000 lb. load. We have designed high strength umbilical clamps for 5,000 lb load. Contact The Subsea Company today for more information.